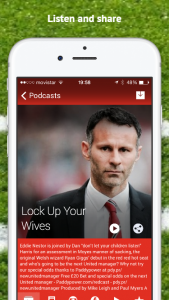 The World’s most listened to Manchester United podcast has an Android app to add to the iPhone app. The Manchester United Redcast is not just informative. It’s highly entertaining, avoiding tedious match stats and pointless opinions on team formation and sticking to the things that really matter to fans, far and wide, tongue firmly in cheek. It’s the funniest ‘Redcast’ out there, so subscribe now and listen to it before the next match.